National Council of Sports (NCS) launched a quarterly magazine that will shed light on Ugandan sportsmen and women’s achievements plus government’s contribution. The 28-page magazine, distributed as a free copy, was launched by NCS board member, Hajj Zubai Galiwango, during a media briefing at the Copper Chimney Restaurant, Lugogo. “There is a lot that we are doing that has seen government increase funding from Shs4.4bn last year to Shs17.4bn this financial year (2018/19),” Hajji Galiwango told the media. While this funding as gone up, Hajji Galiwango noted that it remained insufficient to allow council embark on development of facilities. The acting general secretary Dr. Patrick Bernard Ogwel and the assistant general secretary David Katende attended the media breakfast. “This is another step in implementing our five-year strategic plan as we improve the way we communicate with you and the wider public,” Dr. Ogwel said. Mrs. Janet Kataha Museveni, the First Lady and Minister of Education and Sports, has a message reminding Ugandans to be passionate about success in the sports sub-sector. The State Minister of Sports Charles Bakkabulindi reiterates government’s commitment while there are messages too from NCS Chairman John Bosco Onyik and Dr. Ogwel. The NCS secretariat was appreciative to all the federations and member associations that have endeavoured to comply with the law since the statutory instrument was signed in 2014. In the magazine, edited by Ismail Dhakaba Kigongo, the NCS Corporate Affairs Officer (CAO), there are details on government federation by federation for the first quarter of 2018/19 (July to September). 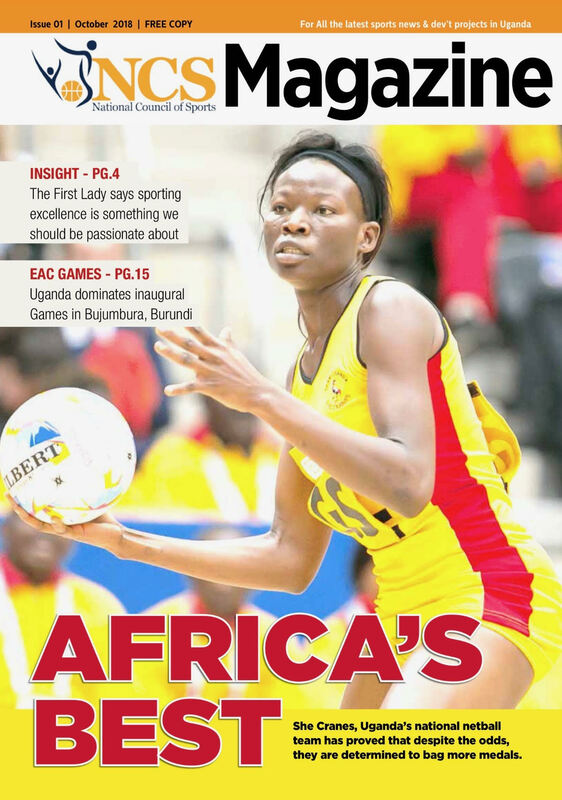 There are glossy stories about the netball She Cranes’ Africa Netball Cup success, Rugby Cranes 7s World Cup journey, U17 Africa Cup of Nations and Uganda’s dominance of the inaugural East Africa Community (EAC) Games among others. A copy of the magazine is accessible on this website.